Our Lembongan PADI Learn & Stay packages offer you peace of mind when planning your vacation to ensure you have an amazing dive holiday. 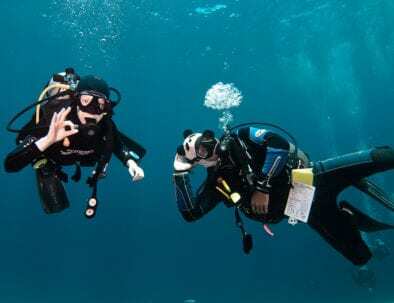 Our PADI Learn & Stay Packages include your selected PADI course conducted by a certified PADI Instructor in small groups, following the highest PADI Standards. Ceningan Divers is an Aqua Lung Partner Centre. Our PADI packages include a full set of dive gear, plus dive computer, 5mm full length wetsuit, DSMB and whistle. 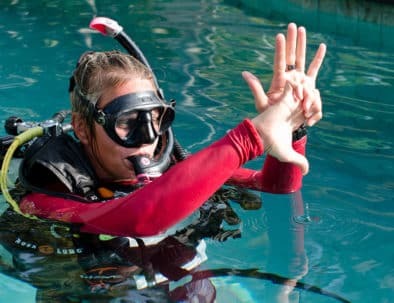 Our 4 Days 3 Nights PADI Learn & Stay Package Advanced Open Water Diver Courses is the best all inclusive option for those who wish to continue their adventure while on vacation in Nusa Lembongan, Bali. This package includes all your meals, accommodation, transfers, PADI material and diving equipment plus 5 adventure dives. Once you complete this course, you will be certified to dive to 30 meters. What’s included in this Lembongan PADI Learn & Stay Package? Day 2 –Breakfast, AOW theory and knowledge review, OW dive 1 and 2, lunch, OWD dive 3, briefing, dinner. Day 3 –Breakfast, OWD dive 4 and 5, lunch, knowledge reviews, dinner. Day 4 – Breakfast, check out, transfer back to Bali on 11:30 boat. Ceningan Divers offers the best all inclusive PADI Learn & Stay packages for you to learn while diving world-class dive sites around Nusa Lembongan, Nusa Ceningan and Nusa Penida, Bali. We aim to make your learning experience memorable. Learn from our experienced instructors, book your PADI Learn & Stay package today!